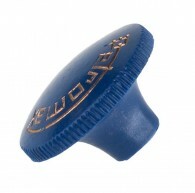 The blue pump knob with Petromax logo for all Petromax models. This classic Blue Pump Knob is decorated with a golden Petromax logo. It is suitable for all Petromax models HK150/250/350/500. Since 2006 the Pelam Shop offers a large selection of kerosene and high-powered lamps, hurricane lanterns with matching accessories and spare parts. Also products for the outdoor kitchen can be found here. In the Pelam forum fans and enthusiasts can access extensive know-how by lamp experts and find answers to open questions around high-powered lamps & Co. These cookies are necessary for the basic function of the website. They help making the shopping cart and checkout process smoother and assist in security issues and conforming to regulations. These cookies allow us to improve our sites’ functionality by tracking usage. These cookies collect anonymous information about interacting with our online shop. These cookies offer the possibility to connect you to your social networks and share content from our sites through social media. Furthermore, they help better tailor advertising to your interests.